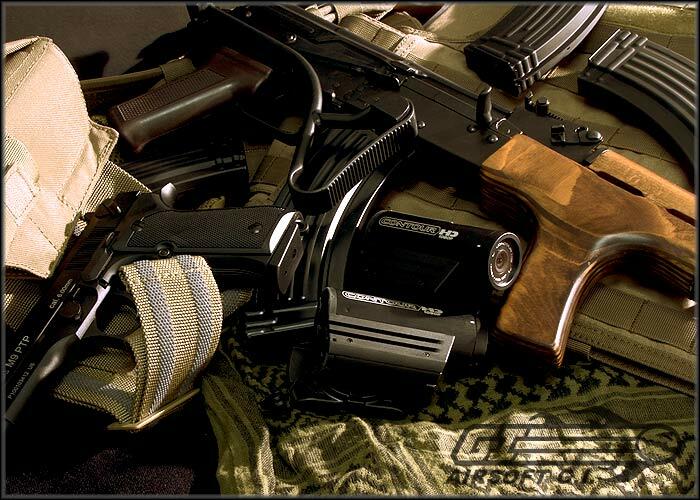 KWA is a well known airsoft manufacturer that has been creating high quality airsoft guns for some time. 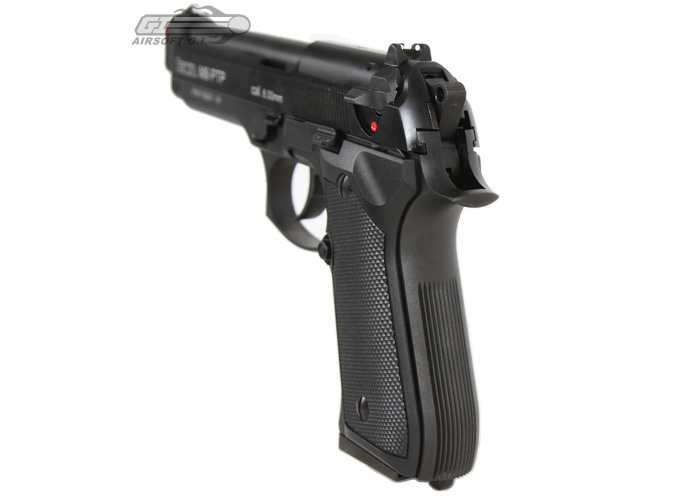 From airsoft electric guns to gas blow back airsoft guns, Engineered to Outperform, defines the quality of their products. Externally, the material they use is designed to withhold a serious amount of stress giving the gun the utmost durability. Internally, the parts used in their airsoft guns are matched to the highest degree for the smoothest operation over long periods of operation. Overall, their product truly performs on the field, KWA products stick to their motto, Engineered to Outperform. 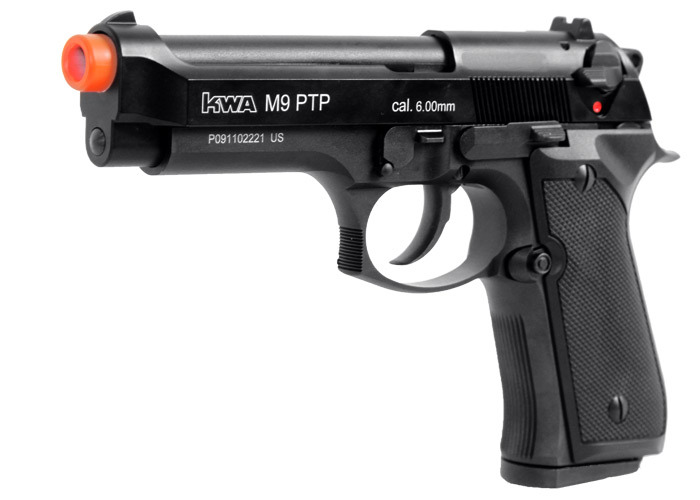 The KWA M9 is a very popular pistol replica; now it comes with a metal slide. The M9 is the current U.S. military issue side arm for all soldiers. The control operations and break down are almost the same as the real article. The slide release, ambidextrous safety, disassembly lever, and magazine release are all functional. In addition, loop at the base of the grip allows the user to attach a retention lanyard. Great gun for great price. 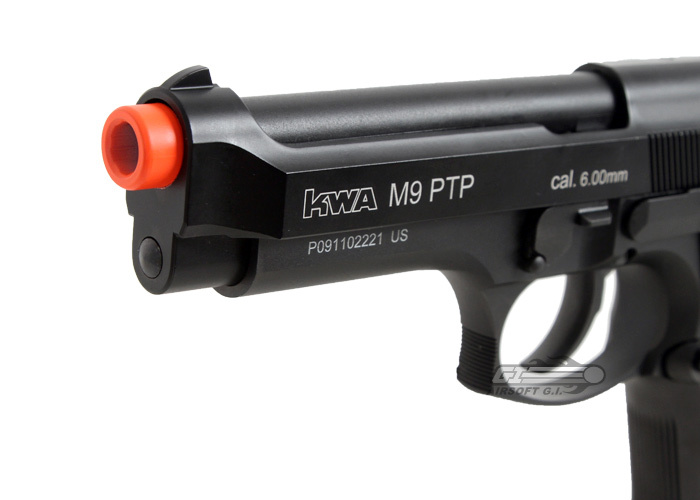 The KWA model does not have trademarks on the slide. Average: Build/parts quality is not adequate for optimum operation or lifespan of the product. A gun with average internals may need tuning or additional labor right out of the box to bring longevity and performance to optimal levels. Good: Build/parts quality is up to par for the gun's stock performance characteristics, reinforcement/replacement of stock parts is not required. Great: Build/parts quality is exceptional, and performance will be outstanding. Overall Rating: On a scale from 1-10 the overall rating encompasses the guns performance, reliability, gas efficiency, build/parts quality, accessories, and warranty (if any). KWA offers a 45-days warranty on all of their products, this Warranty covers all defects in material and workmanship in KWA products occurring during the warranty period. If during the applicable warranty period from the date of original consumer purchase your KWA product is found to be defective by KWA USA; KWA USA will repair, or at its option, replace with new, used, or equivalent model, such defect product without charge for parts or labor. THIS WARRANTY IS VALID IN THE U.S.A. ONLY. FEDERAL REGULATIONS PROHIBITS THE REMOVAL OF ORANGE SAFTEY MARKING FROM ALL AIRSOFT GUNS. REMOVAL OF ORANGE SAFETY MARKING WILL VOID ALL WARRANTY! 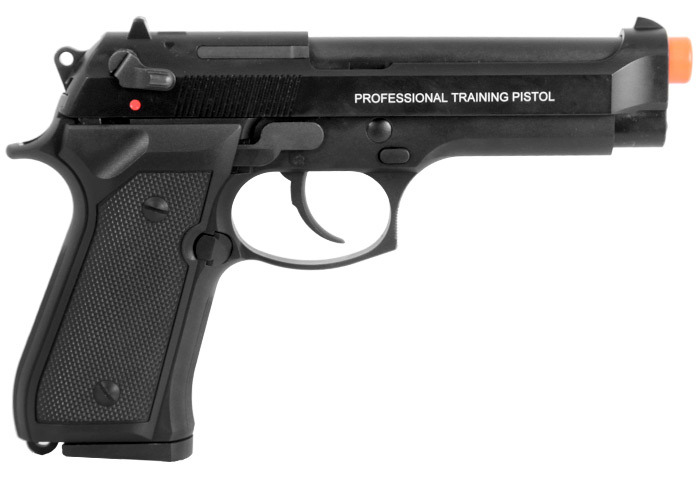 If you are looking for a metal pistol with a realistic weight and kick, then this is the gun for you. KWA is the way to go. 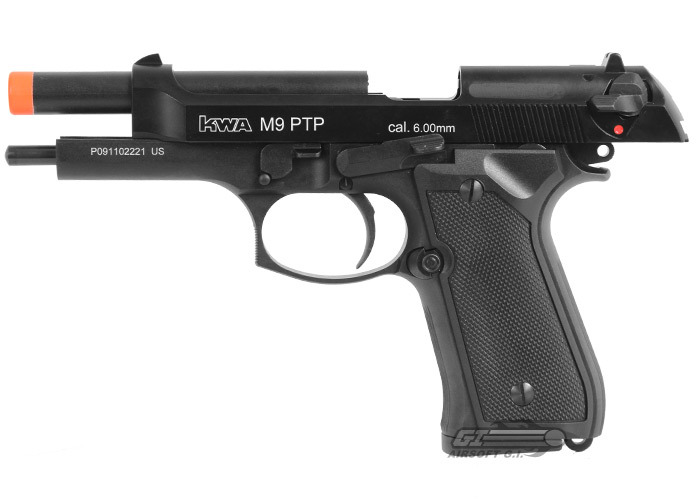 This is a heavy duty pistol and if you are in the market for one please buy this one! There aren't any cons with this gun! I have had this gun for about 2 years now and it is still running perfectly fine. It has a good fps at about 345-357 depending on how hot it is outside. The hop up is easily adjustable with the included tool, and has pretty good range and can hit people at about 110 feet fairly easily. The recoil is great on this pistol and gas consumption is not bad; I'll typically get about 1 1/2 use out of a mag per fill to 2 depending on the temperature outside. It has a nice weight to it which adds to its realism. This is a very reliable sidearm and I find my self always switching to it in some situations. The only problems I've had with this gun were the trigger spring breaking and the slide lock lever breaking as well (both of which are easily fixed). Can I use propane instead of Green gas in this gun? Which parts are not metal? the specs state "full metal slide and body". Obviously this means that the gun is not full metal, but exactly how much is polymer? what is the ns2 system? What does the ns2 system do? What is it for? Is there anyway to have this upgraded to comply with Canada's 366-500 fps rule? Unfortunately, such upgrades are difficult and still won't quite meet Canada's FPS requirements. Does the m9 use the ns2 system? 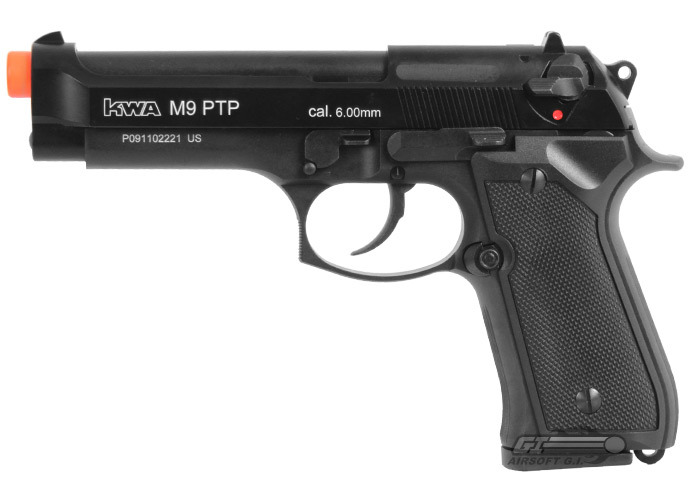 The other KWA pistols have ns2 in their description, but not this one. This does use the NS2 System. Select the item from the Drop Down Menu and click add. This product was added to our catalog on Tuesday 17 June, 2003.